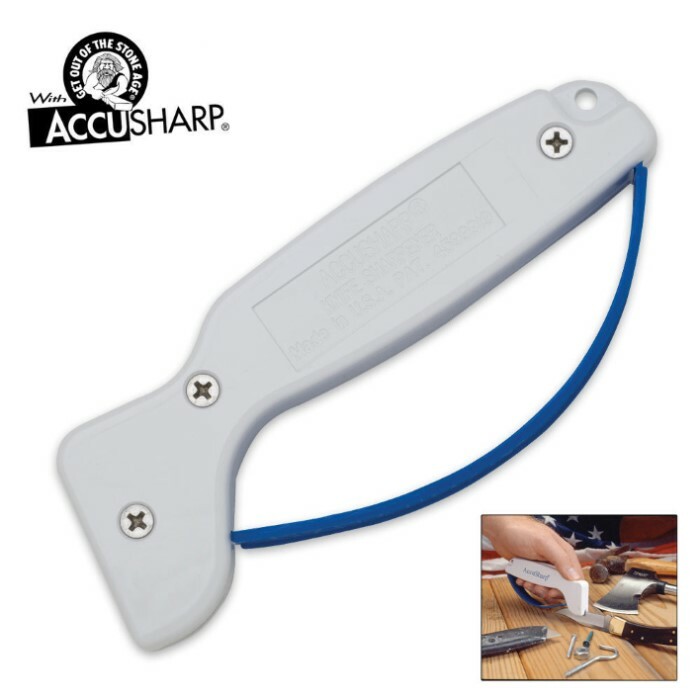 Accusharp Sharpener | BUDK.com - Knives & Swords At The Lowest Prices! 2 or more only $11.00 each! Life expectancy of 5 to 6 years!! Accusharp will put a razor edge on most any knife in less than 10 seconds! It's the simplest, fastest and sharpest knife sharpener on the market. Really took my blades to sharp city like they deserve. Grinds hard and really brings out the best in your blade. Sharpeners can be flipped and switched witch is amazing, litle bigger than how actually shown but i love this and its the best sharpener for the money and the best that i own. This thing makes my blades razor sharp in little time. Its so simple and easy. Great sharpener for a great price! This Is THE BEST Knife Sharpener You Will Ever Buy, And Possibly The Last, Now Its Not A Super Magic Ultra Sharpener That Will Turn A Chunk Of Steel Into An Authentic Katana Edge With One Swipe, BUT, My Friend Found A Tanto That Was Rusted Beyond ALL Imagination, And I Ground On It With My Dremel And File And Things Of The Like, Polished It Nice And By The End, The Back Was sharper Than The Edge, So I Broke Out This And Started Sharpening On The Hunk Of Metal, Within Half An Hour Or So I Was Accidentally Shaving Off Pieces Of Skin On My Fingers, It IS INDEED The Best Knife Sharpener In The World, It Might Take A Little Bit Of Time But It Will Sharpen Anything You Put In It. Does a good job on my sword and machetes makes dem razor sharp but does not want to work om my m48 tomahawk thats wat im dissapointed about. It feels a bit cheap, but it's easy to use and gets the job done. I spent 20 minutes on the sword and it made my day. Works extremely well! AMAZING, MUST HAVE! I'm an avid sword collector and restaurant owner. I took it to work to use as well as at home. Note however the sharpener actually works by shaving the edge of the blade thus making it sharp. So 5 strokes to 8 should be sufficient for any knife/sword. Any more strokes you'll just be grinding your sword/knife away.